This article was published on March 6, 2013. On April 30, 2013, the husband and his attorney objected to the publicity. On May 26, 2013, the husband said he was ready to give the Get. On May 28, 2013, after FOUR long years, the husband gave his wife the Get, and along with it, her freedom. To avoid the possibility that the husband would change his mind, the Get was given to the wife via proxy. There are many gender inequalities in the Orthodox Jewish world, none more heartbreaking than in the area of divorce. 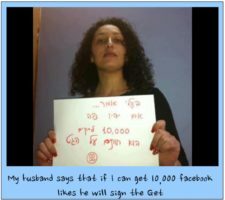 According to Jewish law, only the husband may grant a get – the decree of divorce – and the wife is powerless to leave the marriage without his consent. This system of justice without checks and balances often leaves woman at the mercy of her husband, as she remains an “aguna,” a chained woman, awaiting release.